Tea tumblers are one of those recent innovations that the modern times are letting us enjoy. Today instead of boiling your tea in advance before you leave home and keeping it some container, you have the option of tea tumblers. This allows you to carry the tea leaves with you and when you are ready, brew a new cup of tea and sip it fresh. There are different types of tea tumblers from different manufacturers. They are being produced with different functional options depending on the style and brand you opt to go with. For example, they may be made from glass or metal and brew 1 to 5 cups of tea at a time. 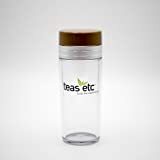 At the Tea Supply we have made sure that we bring together as many different brands, styles and types of tea tumblers so that you can get the one you fancy and fits your budget. You can now forget about having to drink cold old tea and brew a fresh cup every time the urge arises. Tea is a beverage to be enjoyed and the tea tumblers are there for exactly that. Let the tea Supply help you get the right tea tumbler for you. This customer prized is now available in glass and stainless steel! This tea thermos allows for multiple tea infusions throughout the day. Just add a pinch of your beloved tea and hot water. The tea leaves will unfurl and sink to the bottom of the cup. The removeable stainless steel tea filter keeps the leaves out of the way while you enjoy your popular brew. By keeping a small amount of water to cover the leaves, you can enjoy another cup by adding hot water when you are ready for your next cup. Join the Tea Movement! Lets you brew your esteemed loose leaf tea for on the go. All stainless steel lid and filter with double wall borosilicate (pyrex) glass keeps the tea HOT and your hands COOL. Enjoy multiple infusions from the same tea leaves - just keep adding water. Namu Baru's Tumblers are made from dual-wall borosilicate glass and come with a screw-on fine mesh strainer. These tumblers don't leach and give the purest flavor. They fit car cup holders and are immaculate for on the go drinks. Each one is tested to ensure maximum strength. 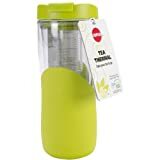 With this travel tea tumbler you'll be able brew loose tea or tea bags in minutes and do it while on-the-go. Plus, this double wall insulated tumbler will keep your tea hot for up to two hours. It has a convenient (and attractive) "carry & go" design and will hold up to 16 ounces. 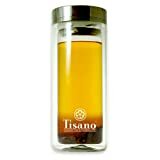 Includes a stainless steel mesh infuser that can be used to hold loose leaf tea or tea bags. 5 year warranty. By Trudeau. Trudeau develops visionary products that add an exciting flavor to your day. Style eloquence, innovation. Trudeau - letting you savor life's little moments. 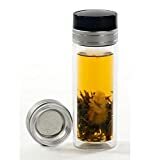 Vacuum Insulated Stainless Steel Tea Tumbler with Infuser. TherMax double wall vacuum insulation for maximum temperature retention. Unbreakable 18/8 stainless steel interior and exterior withstand the demands of everyday use. Leak-proof travel cover seals closed for carefree portability. Separate infuser and drink lids let you brew and enjoy, all in one container. Infuser lid lets you brew tea right in the tumbler. Splash resistant drink lid lets you enjoy any beverage on-the-go. Zojirushi began in Japan in 1918 as a manufacturer of hand-blown vacuum bottles. They are still known today for their high quality vacuum insulated products. Their superior thermal insulation will keep your beverage hot or cold for hours. The 11-3/4-ounce/.35-liter stainless mug with tea strainer allows you to brew fresh tea on-the-go. Tea leaves can be stored in the mug's lid, and each tea strainer includes a handle for easy removal. This stainless steel mug has a nonstick interior coating for easy cleaning, and wide opening to accommodate large ice cubes.